April | 2010 | E-verything! I was ruminating a couple of days ago about how learning, and teaching, have changed in so many ways since I was a scruffy kid at a small rural grammar (high) school in the UK over 40 years ago. Even subjects such as chemistry and biology were taught largely by “chalk and talk” and “read your textbook”. The occasional inclusion of “a film” was just that with a projector and a large reel of film. Even more rarely we migh have the opportunity to watch a BBC Schools programme on a grainy black and white screen as it was being broadcast. Anyway enough of the reminiscence! What was really in my mind was how all of my teachers when I was young were definitely “specialists” they taught in their own (usually quite narrow) field, and were never asked questions or expected to know anything about anything else. I think I have had a “bee in my bonnet” about specialisation since those days. Even then I saw connections between subjects that others seemed unaware of and I found it intensely annoying that everything was compartmentalised. It seems to me (and this is purely my own opinion) that for most of my life (until about the last 12 years) there has been a huge emphasis on specialisation. People have been encouraged for a long time to “know more and more about less and less” whether it be the works of a particular author who wrote two books or the lifestyle and physiology of a minute insect. I have always found this type of very narrow focus almost impossible for me as this degree of specialisation often seems to exclude the broader context in which the subject is set. It also (from my perspective) tends to diminish the opportunities for cross disciplinary input. As one of those people with polymathic tendencies – and I am using polymath in its sense of varied (cross disciplinary) knowledge rather than in the sense of knowing a vast amount – I have often felt that I am labelled in a number of ways. Some of those labels that have been applied to me over the years are: “having a magpie mind” in the sense of remembering a lot of unimportant “glittery stuff”; “butterfly minded” ie flitting from subject to subject; “academic lightweight” with its implication that just because I have not chosen to “pile it higher and deeper” about one topic I therefore lack the capacity to do so! My perception is that it is now more acceptable to be a polymath than it has been for many years. The ruminations that gave rise to this have also led me to wonder on the validity of this perception and consequently why this might be so. The first instant thought was that this is a result of the exponential growth of easily available information through Internet publishing and increased access. In my opinion the skills of a generalist and synthesist (often held by polymaths) are better suited to a burgeoning information situation than are those of a specialist. There is also the additional point that, with increased access to information, specialists are no longer the exclusive curators of detailed knowledge and information. Perhaps this is why (in my opinion) polymathy (and respect for it) is on the rise. However it may just be the usual cyclic nature of change – there have been other times when polymathy was common. Both the Renaissance period and the late 19th Century stand out in the number of polymaths who were high achievers in more than one field. Finally, all I have written here is just “my take” I have no supporting evidence for any of these thoughts and opinions – just my own feeling from what I see around me and in my PLN. So my perception of a rise in polymathy is just that. As always, I would be most interested to hear your point of view. This session (recording here) was fast moving and seemed to work OK after a messy start. It was definitely “one of those days” with respect to me and technology! I had to log out and clear my Java cache because everything was freezing on me. I have had a few issues like this recently and I suspect that there is some conflict caused by the new client provided for remote access to my workplace network. 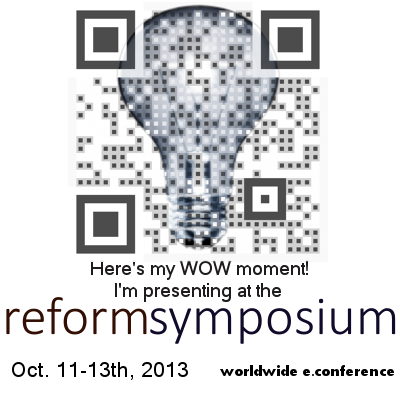 I have also been having a few problems with font sizes changing when I upload Powerpoints to whiteboards. I have concluded that this could be because I am using a mix of 2003 & 2007 Powerpoint versions to edit and then saving in 2003 format but Elluminate is using 2007 version to upload. We often hear criticism that those of us educators that are “into” technology use it for its own sake rather than to enhance learning. This seemed to me to be an interesting topic to explore, and one that would make for a good “Talk Time” session, hence “Tech For Tech’s Sake”. The session began with a drag and drop activity to take a look at what we understand to be technology – this in itself showed how interpretations vary from person to person. We then moved on to consider whether we as individuals felt that we had personally used technology for its own sake. There were a majority of us who felt that we had! We moved on to a whiteboard to explore the underlying reasons beneath our perception that we were sometimes using technology for technology’s sake rather than specifically for learning enhancement. In fact most of the reasons we came up with seemed to be the underpinnings most of us use to enhance learning with just a few having different purposes. These included using the technology to: become eligible for funding opportunities; impress others; work paperless. 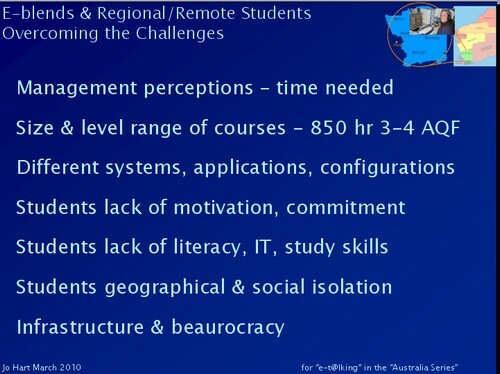 Another reason that seemed not quite to fall into enhancing learning was that of providing access to remote or other students who would not be able to particpate at all otherwise. Following on from the reasons for using technology we took a brief look at which technology we use, with a consideration of whether we sometimes try and use too many different things. Considering the “good” and “bad” possible impacts of using the technology for reasons not specifically related to enhancing learning gave us more “good” than “bad” impacts.The final conclusion was that almost everyone felt that there either were, or might be, good reasons for using technology in our teaching other than enhancing the learning. I am never sure how well these kinds of discussion really work. I always try to make them very structured within a framwork of stimulus questions. Then keep them on topic and moving on quite fast. This is because in my opinion they otherwise become too much like the Serendipity Sessions which are intended to be fairly unstructured discussions and to “go wherever they go”. My usual problem (especially when there are several people not using microphones) is to get audio input from others and then to make that judgement call about how long to let silences go before starting to talk again. I have noticed that when there are 2-3 people without microphones or having audio issues then more people migrate to chat as the preferred interaction – the chat was very busy in this session. When this happens I often feel that I am (as usual) talking too much! However I do feel I have to keep some audio happening because: active chat is very difficult to follow for people relatively new to Elluminate especially if they don’t know how to change the windows for a larger chat space; long silences unless prewarned tend to give people the impression that their audio output has stopped working. So I have a continual juggling act with myself to try and “get it right”. I am very aware that I can’t possibly “please all of the people all of the time” but I am still trying. Serendipity Webinar Overview – No Ning? This session (recording here) was truly topical as the news had just broken that Ning sites were no longer to be available free. 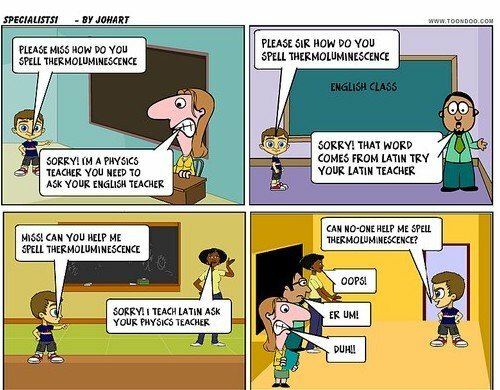 This is the second similar such issue within recent weeks that is making huge waves amongst educators in the E-sphere. The first being the (as it turned out) temporary loss of Wordle. There was no question about the choice of topic for this session as the majority of those in the room at the polling stage very much wanted to discuss the impact of losing free Nings on the educational community and to share preliminary thoughts about options. We started by capturing initial reactions to the news on the whiteboard. As might have been expected the reaction was of strong concern and anxiety about the available alternatives and about how to maintain communities through a probable transition to a different platform. These sentiments also continued to be expressed through text chat and audio. There had already been considerable activity on Twitter and elswhere relating to possible alternatives – one of the initiatives is a collaborative Google document – Alternatives to Ning where people have added any potential substitutes that they are aware of. We moved on to take a quick look at these by Application Share of the Google doc. There were a variety of mostly free platforms of varying types listed some with comments from the lister or others who had used the platform. We used this listing to invite comment/information from those in the session with experience of any of them – providing useful input for everyone on some of the options. Towards the end of the session we were joined by Sue Waters of Edublogger fame. Sue is currently involved in work on Buddypress for Edublogs and gave us a quick “heads up” on its features, including briefly sharing one of her trial sites. At this stage we were fast running out of time so the session drew to a close. This was a very lively session – as always when the topic is one where passions run high. It seems that debate will go on for some time until people find alternatives or decide that paying for Ning is easier than moving platforms. 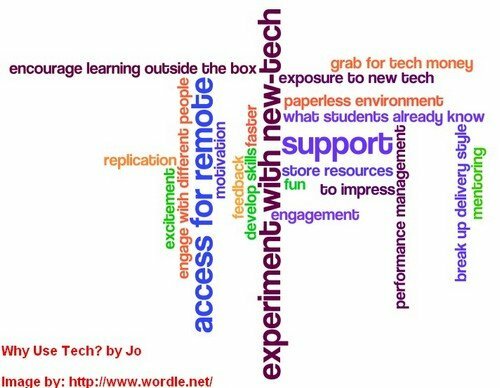 The upcoming Edublogs webinar this week is a “Talk Time” discussion session: “Tech for Tech’s Sake?” a facilitated discussion on the use of technology in teaching. This session (recorded here) was great fun! Despite loss of Internet at our end in the early stages. Our system (ie that of myself and Phil Hart) has been so reliable for the last couple of years that I had become a bit complacent and was out of the habit of automatically giving someone else Moderator status in case of problems. Suffice it to say that our connection came back up just as Phil was starting our backup satellite link. We returned to the session where everyone, with great confidence in our imminent return, had continued chatting. I instantly gave Moderator status to another participant. As a result of this I will make a big effort to revert back to my former practice of giving someone else Moderator status in each session. In the early days of these sessions I tried to rotate the extra moderator around fairly regular participants. I think that doing this is very good practice anyway as it gives people a gentle introduction to the role and an opportunity to see the extra tools that are available to Moderators. 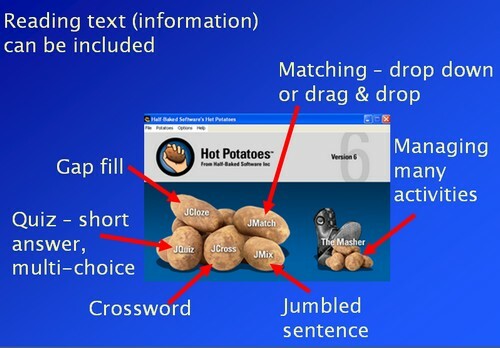 Hot Potatoes (download from here) is a free easy to use application for developing simple interactives. These can be saved in one or more of several different ways including SCORM compliant and webpage formats. It is one of several free applications that I use regularly to create activities that I can upload into our Learning Management System (LMS). I followed my usual practice at the start of trying to get a “feel” for where everyone was “coming from” on Hot Potatoes. On this occasion it seemed that most people were relatively unfamiliar with it. I also made a brief comparison with two other freely available applications that I also use: ARED (downloadable from here ) developed several years ago with Australian Flexible Learning Framework funding; and eXe (available here) developed collaboratively in New Zealand. We had a very brief look at the types of activity that can be created. Then we moved on via a Web Tour to our (mine and Phil’s) Moodle playground where we had uploaded some activities (taken from those I use with my literacy and study skills students). This gave everyone the opportunity to try out a few activities from the student perspective by logging in as “Guest” and accessing them through “Hot Potatoes 101”. Having seen some activities from the student perspective we moved on to make an activity. The consensus was to collaboratively produce a quiz. For this I used Application Share – shared part of my desktop, started the JQuiz Hot Potatoes quizmaker and gave volunteers control of the application to write a question each. As we reached the end of the session there was lively discussion in text about the features of Hot Potatoes; the potential for use in different ways including giving students opportunities to create activities themselves and a brief consideration of whether the application does anything you can’t do with pencil and paper. This has given me food for further thought and has generated a discussion topic to form the basis for our next Fine Focus session in 2 weeks time. Despite the messy start due to the Internet glitch the feedback was positive and I was reminded yet again how much people like the opportunity to try things out in the session. This, as always, reinforces my desire to keep “improving my act” and thinking of more ways to include interactivity in webinars. This recorded session was for “eT@lking” organised by Ann Mirtschin and Carole McCulloch in the “Australia Series” – itself a relatively recent LearnCentral opportunity intended to facilitate the provision of more Webinars at “Australia friendly” times. The reference to Australia in the title refers only to the timing and perspectives from around the globe are definitely most welcome! 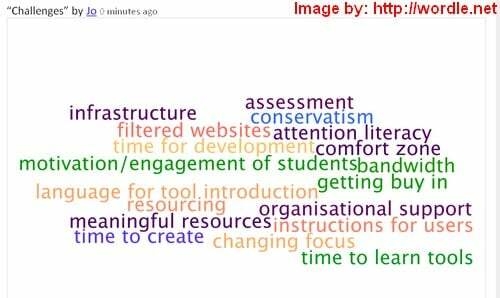 Ann has given a great overview of the session in her discussion posting on LearnCentral NB you do have to be a logged in member of LearnCentral to access this, and now in her blog also. For the first time in many months I was talking explicitly to my peers about what I am doing with my own students in the here and now. I so enjoyed this session! Sharing what I am trying to do and seeking feedback from other educators a number of whom have experience with similar target groups either in Certificates in General Education or other contexts was a great “industry contact” experience. … that closely matched what I have found to be the issues I encountered in trying to get the e-blend approach off the ground. We then moved on for a quick look at some of the strategies I had used to try and overcome the issues. This included sharing some pages from the Learning Management System. I had hoped to give someone else control of my desktop and ask them to move through some pages but time was too short to do this. I ended by asking if the group thought my strategies went some way towards addressing the challenges and asking for suggestions and ideas about what else I might do. … were very positive and indicated that people found what I was doing interesting, relevant to my learners and useful. Our next Webinar is an Edublogs “Techie How To!” session “Feed Learning with a Hot Potato!” In this session we will take a look at and have a “play” with Hot Potatoes. Despite a comment from someone on Twitter recently that it is “very tired and outdated” I still use Hot Potatoes to make interactives for my students. It is easy to use; works well for many of the activities needed to develop reading and writing skills and; I can upload the products easily into the Learning Management System. Join us on Thursday April 8th at 23:00 GMT (7pm USA EDT) or Friday April 9th at 7am West Aus, 9am NSW, 1am CEST depending on your timezone – in the usual Elluminate room.